Today we highly value personal care, but until the early 18th century, a man could in his life never to dive into the water. Many people believed that bathing - this is an unhealthy thing, and "soak" his body in water, especially hot, allows various diseases and infections to enter the body. Even if people still like to take a bath, he did it in the clothes! This habit persisted until the late 19th century. Until the 1880s people did not think about creating a deodorant, despite the fact that most of them most of the time had very bad smell, but no discomfort from this, they have not experienced. Rich tried to mask the odor lots of spirits, but today, everyone knows that this method does not work. It is worth noting that even in the 9th century scholar Ziryab (Ziryab) proposed the idea of ​​a deodorant for underarms, but it did not take. Up until 1888 there was nothing like that. That was the year has begun mass production of the first deodorant that had phenomenal success in the west. These deodorants are available today and are marketed under the brand name "Mom". Women did not care for the hair on the body. In the Western world removal of hair from the body was not common until the 1920-ies. There are, of course, some countries, women are still not doing anything with their hair on the body. However, it is not worth talking about it right now. The house in that period of time the ill-smelling natural feces of a human organism. Then there was no running water, and most of the people there were excreting in a pot, which might have been left until someone did not dare to throw out its contents to the nearest window. Later pots have been preserved in some of the houses, but had already been created by open toilets. However, even in the Victorian era, pots were used as emergency toilet in the night. 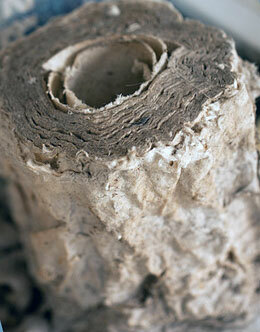 Toilet paper was invented in the late 18th century, and until then people used the materials at hand. The rich could afford the luxury of a piece of cloth to wipe yourself. Poor people used old rags, leaves, moss and ... hands! Even the ancient Romans were better - they are used for this purpose cloth wound around a stick, and then immerse it in a bucket of water.